Media Assail Israel, US for "Crime Against Humanity"
Abu Dhabi (WAM)—The UAE press has lambasted Tel Aviv and Washington in the wake of Israel's air strikes on the Lebanese village of Qana on July 30, with one of the dailies demanding that both Israeli leaders and their allies be brought to justice. Although lashing out at Israel, the Gulf Today of Sharjah places the US on equal footing with its strategic ally, saying it cannot walk away from its role in the massacre in Qana. "If there is any respect for human rights — and indeed self-respect and dignity of human life — left anywhere in the world, it warrants that the Israeli political and military leaders be charged with war crimes and crimes against humanity and their allies be tried as accessories before, during and after the fact," commented the paper in an editorial on July 31. Another English language daily, Gulf News, said it is obvious that an immediate ceasefire is necessitated not by the politics of the war but by the reality of a spiralling loss in human life. "The savagery of Israel's war machine must stop now unconditionally, unreservedly, without hesitancy or delay. This is non-negotiable," stressed the Dubai-based newspaper. Commenting on the visit to the Middle East by US Secretary of State Condoleezza Rice and the bombardment of Qana which left 60 Lebanese villagers killed, Khaleej Times of Dubai said Lebanon continues to burn because the US and UK refuse to rein in Israel. The paper said Rice had no brief on Lebanon or the Middle East and that is why her shuttling between Beirut and Jerusalem had nothing to show by way of results. "She has her hands tied behind her back and is merely doing what her neo-con masters in Washington want her to do. And they do not want an end to this war - not just yet," argued the paper. The newspaper further suggests that an international peace force is not a bad idea, especially if it includes troops from EU states. However, it went on to ask: "But what can such a force do without a mandate to enforce peace and what if Israel isn't willing to hold fire? Long term peace, Khaleej Times believes, lies in an early resolution of the Middle East conflict. 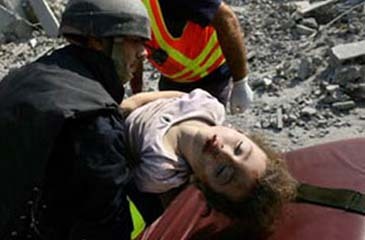 Israel, it added, must come to terms with the reality that it can never win this endless war on the Arabs. "Its future, just as that of its neighbours, lies in just peace."